Joel Futterman's Site - I'm managing Joel's site and there are a number of my photos - including CD designs. Byron Morris and Unity's Site - I'm also managing Byron's site and there are a number of my photos - including CD designs. 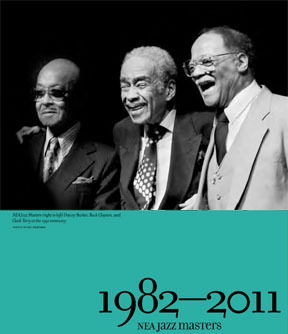 The National Endowmment of the Arts 30th anniversary Jazz Masters publication contains a bunch of my photos. Eremite - has used a number of my photos on its CDs. With Raphe Malik, Jemeel Moondoc, Glenn Spearman, Trio Hurricane, Peter Brotzmann, Alan Silva, William Parker, Kidd Jordan, Fred Anderson, Marshall Allen, Hamid Drake, Test, Tom Bruno, Sabir Mateen, Denis Charles, etc. Jazz Connect - DC area jazz musician websites, CD store, jukebox and free MP3s. DC Jazz - Another DC area site with jazz musician websites, CD store, jukebox and free MP3s. OUR-DC - A DC culture site that links to my DC jazz photo page. Point of Departure - Bill Shoemaker's on-line jazz e-zine takes a great look at the progressive side of "jazz." With guest columnists, reviews, contsts, and many of my photos (search the archives). Jazz Times - Jazz news, jazz concert reviews, in-depth features, photography, artist profiles, reviews. Down Beat - Magazine devoted to "jazz, blues and beyond" Daily online news from Down Beat magazine. Jazz Improv Magazine - Magazine with music and ideas for all jazz enthusiasts. All-About-Jazz - Great Jazz Resources and Information. Monthly columns, active chat forum, and browsable archive including artists' profiles, photos, gigs, festivals, news, reviews, and interviews. Jerry Jazz Musician - E-zine featuring sketches of jazz greats, album art and liner notes, feature articles and sound files. Vision Festival - America's premier festival of creative music, poetry, dance, art and photography. National Endowment of the Arts Jazz Masters - The NEA every year honors up to seven jazz musicians with Jazz Master Awards. The National Endowment for the Arts Jazz Masters Fellowships are the highest honors that the United States bestows upon jazz musicians. Jazz Journalist Association - Online zine of the Jazz Journalists Association. Articles, photos, reviews, discussions on all aspects of jazz contributed by members of the JJA. The Institute of Jazz Studies - It says "the world's foremost jazz archive and research facility"
The Chicago Institute of Jazz - Great information, get their newsletter. Jazz-Institut Darmstadt - Europe's largest public research archive on jazz. New Orleans Jazz National Historical Park - The recent addition to the National Park system commemorates the origin and development of jazz. Check the schedule if you're going to New Orleans. Big Apple Jazz - New York City Jazz Club Bible. QuitDay.org - helps musicians, vocalists, and others quit smoking and lead healthier lives. The American Cancer Society - also supports tobacco-free living. The Outreach Program at Consumer Dangers is dedicated to keeping the public informed about consumer dangers and safety issues associated with numerous products that can cause the public serious harm. Our website is continuously updated with breaking news from Government agencies, Watchdog Groups, and concerned citizens regarding product recalls and medication safety. The Recall Report - Reporting on the latest dangerous DRUGS and products to keep you and your family safe - up-to-date information provided on recalls, alerts, and side effects.